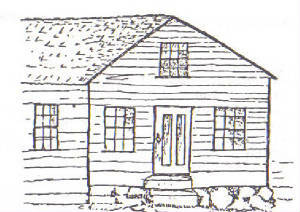 Sketch from "History of the 9th & 10th Rhode Island Volunteers"
Built in 1840, the first church (and Sabbath School) in Tennallytown was the Mt Zion Methodist Church pictured above, on the corner of River Road and Murdock Mill Road, about 100 yards from the intersection with the Rockville Road. Source: Helm, J.B. (1981). Tenleytown, D.C.: Country Village into City Neighborhood. Tenally Press, Washington D.C., pp. 92, 125-127.